The new MACDefender malware was first noted on Saturday by users of the Apple Support Communities, and was highlighted on Monday by antivirus company Intego. If the right settings are enabled in Apple's Safari browser, MACDefender can be downloaded to a system after a user clicks a link while searching the Internet. However, users must still agree to install the malware after it downloads. 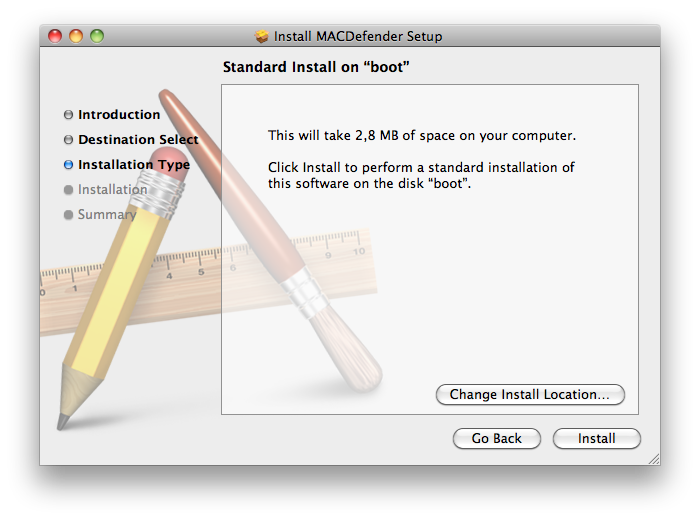 After the ZIP file is extracted, users are presented with the "MACDefender Setup Installer," at which point they must agree to continue and provide an administrator password. Because of the fact that users must agree to install the software and provide a password, Intego categorized the threat with MACDefender as "low." Users on Apple's support forums advise killing active processes from the application using the Mac OS X Activity Monitor. MACDefender can then be deleted from the Applications folder by dragging it into the trash. The malware is not to be confused with MacDefender, the maker of geocaching software including GCStatistic and DTmatrix. The company noted on its site it is not affiliated with the malware. Malware spreads through search engines like Google via a method known as "SEO poisoning." The sites are designed to game search engine algorithms and show up when users search for certain topics.